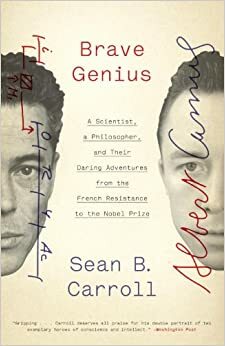 In Brave Genius: A Scientist, a Philosopher, and Their Daring Adventures from the French Resistance to the Nobel Prize* (2014) University of Wisconsin molecular biologist Sean B. Carroll is the story of two men who tried to live ethical lives during some of the world’s darkest hours. Brave Genius follows the parallel lives of Albert Camus and Jacques Monod, two of twentieth century France’s greatest thinkers and ethicists. Both men were Nobel Laureates (Camus for literature, Monod for physiology) whose professional successes were matched by their activities—both overt and covert—as public intellectuals. During the German occupation of France in WWII, Camus and Monod were active members of the French Resistance: Camus wrote scathing editorials in the Resistance newspaper Combat while Monod led sabotage missions—activities frequently punished by execution. After the war, both men became outspoken critics of Soviet-style Communism and the stultifying effects of totalitarianism on personal liberties and public discourse. The strongest aspect of Brave Genius is in its characterization of Monod and his daring-do. Truly, it is Monod who is the hero of this book—and rightly so. Until I read Brave Genius, I was not familiar with Monod, his awarding winning work on gene expression, or even his contributions to French intellectual life. Carroll’s tight, tension-building prose underscores the gravity of Monod’s heroic actions. Ironically, Brave Genius’s greatest weakness is its central marketing point: the friendship between Monod and Camus. The book is marketed as an exploration of the formative friendship between Camus and Monod; Carroll goes so far as to claim that Camus’s friendship with Monod was on the most indelible relationships Camus ever had. However, Carroll only succeeds in showing how the men lead parallel lives, the reader is left in the awkward position of having to accept that the men had a fraternal bond based on a few excerpted letters and the author’s word alone. Had Carroll brought the friends together more within the pages of Brave Genius, this claim at deep friendship would have seemed less tenuous. Overall, Brave Genius is well worth a read for Camus fans, French culture enthusiasts, and war buffs alike. *This book was sent to me by the publisher for review. I have not been financially compensated for this review and the thoughts expressed herein are my own.